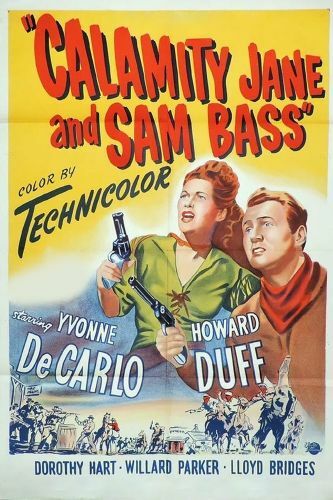 For various reasons, the 1949 western Calamity Jane and Sam Bass has a rather poor reputation amongst film buffs. Many observers feel that stars Yvonne de Carlo and Howard Duff merely go through the motions, while others complain that the usually dependable Universal-International production values are largely absent. Recent cable-TV showings of this film have revealed that, while not in the same league as Stagecoach or Winchester 73, Calamity Jane and Sam Bass is a relatively entertaining rehash of a familiar story. Most of the film consists of Bass' rise to notoriety as a colorful outlaw. On the verge of retirement, he agrees to one last holdup, which proves his undoing. According to the film, Calamity Jane remains by Bass' side throughout his various exploits, even though she ultimately loses him to "nice" girl Katharine Egan (Dorothy Hart).